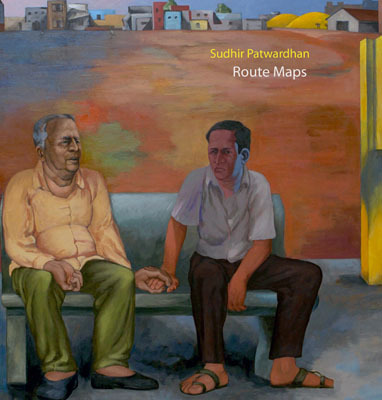 Sudhir Patwardhan was born in 1949. He graduated in medicine from the Armed Forces Medical College, Pune. He moved to Mumbai in 1973 and worked as a Radiologist in Thane from 1975 to 2005. His first one person show was held by Ebrahim Alkazi’s Art Heritage Gallery in New Delhi in 1979. Since then his work has been seen regularly in exhibitions in India and abroad. His selected museum shows include ‘Social Fabric’, curated by Grant Watson, INIVA, London; Lunds Konsthall, Lund, Sweden; Bhau Daji Lad Museum, Mumbai (2012); ‘Modernist Art from India’, curated by Beth Citron, Rubin Museum, New York (2011); ‘Modern Indian Art- The Ethos of Modernity’, Sichuan Museum, Shenzhen Museum, Zhejiang Museum, China (2010); ‘ReVisions, Indian Artists Engaging Tradition’, curated by Susan Bean, Peabody Essex Museum, Salem, Massachusetts, USA (2009); ‘Horn Please – Narratives in Contemporary Indian Art’, curated by Bernhard Fibicher and Suman Gopinath, Kunstmuseum Bern, Switzerland (2007). His recent solo shows include ‘Family Fiction’, Sakshi Gallery, Mumbai, Lalit Kala Akademi, New Delhi (2011); ‘The Crafting of Reality’, The Guild, Mumbai (2008). A monograph on his work, ‘The Complicit Observer’ written by Ranjit Hoskote, was published in 2004. This was followed in 2007 by another book by Ranjit Hoskote on Patwardhan’s drawings – ‘The Crafting of Reality’. This is tranaslated into Marathi as ‘Rekhachitravichar’, published in 2012. A monograph in Marathi, written by Padmakar Kulkarni was published in 2005. Anjali Monteiro and K.P.Jaysankar have made a film on the artist, along with the work of the poet Narayan Surve, titled ‘Saacha’, in 2001. In 2008- 2009 Patwardhan curated an exhibition of Indian Contemporary Art ‘Vistarnari Kshitije’ / ‘Expanding Horizons’ which travelled to eight cities in Maharashtra. His second curatorial project, in 2011, was an exhibition of the drawings of ten artists, shown in The Guild Art Gallery, Mumbai and Sudarshan Art Gallery, Pune. Patwardhan’s works are in the permanent collection of National Gallery of Modern Art, New Delhi and Mumbai; Roopankar Museum, Bhopal; Kiran Nadar Museum of Art, New Delhi, Jehangir Nicholson Collection, Mumbai; the Peabody Essex Museum, Salem, USA and other prominent private and public collections. The artist lives and works in Thane, near Mumbai. R. Siva Kumar was born in Kerala 1956. He was educated in Kerala and in Santiniketan. Siva Kumar is presently Professor of Art History at Visva Bharati University, Santiniketan. He has curated several important exhibitions and written extensively on Modern Indian Art. His publications include The Santiniketan Murals, 1995; Santiniketan: The Making of a Contextual Modernism, 1997; K.G. Subramanyan: A Retrospective, 2003; A. Ramachandran: A Retrospective, 2004; K.S. Radhakrisnan, 2004; and My Pictures: A Collection of Paintings by Rabindranath Tagore, 2005. Along with Gulam Mohammed Sheikh, Siva Kumar curated Benodebehari Mukherjee : A Centenary Retrospective, and edited the accompanying publication. His volume Paintings of Abanindranath Tagore, was published in 2008. He has recently edited Rabindra Chitravali, a four-volume compilation of Rabindranath’s paintings and he is the curator of the exhibition of Tagore’s paintings that is travelling to eight major museums of the world to mark the 150th birth anniversary of Rabindranath Tagore. Ranjit Hoskote is a cultural theorist, curator and poet. He has authored more than 20 books, including The Complicit Observer: Reflections on the Art of Sudhir Patwardhan (Sakshi Gallery/ Eminence Designs, 2004), The Crafting of Reality: Sudhir Patwardhan, Drawings (The Guild, 2008), Zinny & Maidagan: Compartment/ Das Abteil (Museum für Moderne Kunst, Frankfurt/ Walther König, 2010), I, Lalla: The Poems of Lal Ded (Penguin Classics, 2011), and Dom Moraes: Selected Poems (ed., Penguin Modern Classics, 2012). Hoskote’s essays have appeared in numerous volumes, including Elena Filipovic et al eds., The Biennial Reader (Hatje Cantz, 2010), Maria Hlavajova et al eds., On Horizons: A Critical Reader in Contemporary Art (BAK, 2011), and Sølveig Øvstebo ed., Marianne Heier: Surplus (Bergen Kunsthall/ Sternberg Press, 2012), as well as in the catalogues of numerous international exhibitions, most recently, Indian Highway (Serpentine Gallery, London/ Walther König, 2008) and India: Art Now (ARKEN Museum, Copenhagen/ Hatje Cantz, 2012). With Nancy Adajania, Hoskote is co-author of The Dialogues Series (Popular/ foundation b&g, 2010). He has curated 22 exhibitions, including a mid-career survey of Atul Dodiya (Japan Foundation, Tokyo, 2001) and a retrospective of Jehangir Sabavala (National Gallery of Modern Art, Bombay and New Delhi, 2005-2006). Hoskote co-curated the 7th Gwangju Biennale (Korea, 2008) and was curator of India’s first-ever national pavilion at the Venice Biennale (2011). Cheque to be issued favouring The Guild.